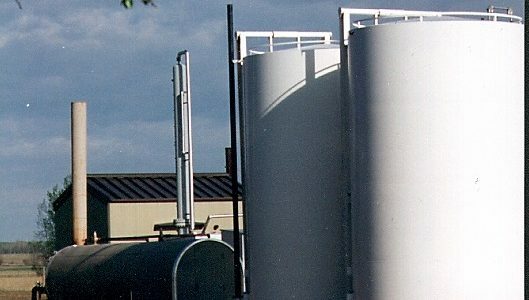 High-capacity storage tanks are vital to many businesses including manufacturing facilities, municipal water distribution systems, wastewater treatment facilities, power plants, the oil and gas industry, and fire protection systems. They are often used to store potable water for municipal water systems, chemicals for manufacturing, fire suppressants drilling fluids, crude oil or refined fuels, and to perform well they must be water-tight, easy to maintain and repairable. Traditionally, large storage tanks have been either made from steel, which welded together and finished depending on size either offsite or onsite or concrete, which poured in place at the facility. Both types of tanks perform well but have some serious disadvantages. Offsite welded tanks can add significant transportation cost, Field-welded steel tanks can be difficult to finish properly at the site, leading to an increased probability of corrosion, and the welds must be thoroughly inspected after completion to ensure that the tank will not leak. Concrete tanks are exceedingly heavy, take large amounts of time to cure, and need constant resealing to prevent leaks. A third option bolted tanks, which use laser or die-cut steel panels that are bolted into place onsite. Bolted tanks offer the strength of steel, are quick to install and easy to maintain or repair. Compared to concrete or field-welded steel tanks. Steel tanks must be welded and inspected onsite, and concrete tanks must pour in place. Both require days of installation time, including plenty of labor and the associated costs, and if there happens to be inclement weather, the installation process can be delayed or postponed. Because bolted tanks are manufactured offsite and arrive in ready-to-assemble sections, installation is quick and easy, and it can be constructed in just about any weather. Unlike field-welded or concrete tanks that must be sealed and coated onsite, bolted tanks come in pre-finished sections. Each section manufactured at an environmentally-controlled manufacturing facility, where the metal is formed and welded, then the surface coating is applied before there is any chance of corrosion taking place. The bare metal coated with a silica and zirconium liquid seal that inhibits corrosion and encourages adhesion of the final surface coating, which is an epoxy powder coating that is electrostatically applied and heat-cured to ensure a durable, corrosion-free finish. Because the metalwork and finishing work done at a manufacturing facility, there is less pollution and waste involved in the finishing process. Welded steel and concrete tanks are finished onsite, which often involves sprayed-on sealants that have environmental consequences if applied incorrectly, and the process can easily delay by bad weather, such as rain or wind, which can inhibit the curing of the sealant or lead to over-spray. In some municipalities, restrictions may be placed on how or when the sealants can be applied, leading to delays or high compliance costs. With no onsite finishing required, bolted tanks are much more convenient and environmentally friendly. Bolted steel tanks allow installation flexibility that surpasses steel or concrete tanks. They are available in sizes ranging from 2500 gallons to over 2 million gallons, and they can be customized to fit the allocated installation space. For narrow areas, the tank can build taller, and in wider areas, the width can increase. Bolted tanks can be built over a grade band foundation, a concrete ring wall or a full concrete slab, depending on the project requirements and local regulations. Should the need for more capacity arise in the future, bolted tanks can also easily expanded with a minimum investment of materials and labor, unlike concrete or welded steel tanks, which would require considerable amounts of time, materials, and labor to either expand an existing tank or build a secondary tank? Because bolted tanks built with modular panels, it simply requires more panels and the time and effort required to reconfigure and expand the existing tank. Concrete and steel tanks need regular maintenance, including frequent resealing to prevent leaks or corrosion. They are also difficult to repair, requiring extensive labor and special tools to pour new concrete or to cut, weld and refinish a steel tank, which can lead to high material and labor costs. Bolted tanks require minimal maintenance and last longer than welded steel or concrete tanks, and should a gasket ever leak, a panel corrode or an accessory such as a valve or door need to be repaired, the damaged part can easily be unbolted and repaired or replaced. Because bolted tanks shipped disassembled, they are more compact to transport than the large sections of a welded tank, reducing shipping costs. Compared to the materials required for a concrete tank, shipping costs are much lower for bolted tanks as well, because they are relatively light compared to concrete. Como os tanques aparafusados são transportados desmontados, eles são mais compactos para transportar do que as grandes seções de um tanque soldado, reduzindo os custos de transporte. Em comparação com os materiais necessários para um tanque de concreto, os custos de envio também são muito menores para os tanques aparafusados, porque eles são relativamente leves em comparação com o concreto. Bolted tanks are a cost-effective, durable and low-maintenance alternative to both welded steel and concrete tanks. Bolted steel tanks can be manufactured in a wide variety of capacities, ranging from a few thousand gallons to over a million. They can be custom designed to fit your particular application, with varying widths, heights, and other characteristics. In areas where space is limited, the tanks can be made tall and narrow for a smaller footprint, or they can made wider where vertical space is constrained. The design options are practically limitless and can allow for great flexibility in demanding applications. steel tanks are made from individual sections that formed, welded and finished at a controlled manufacturing facility, using high-quality carbon, galvanized or stainless steel that meets applicable ASTM and API requirements. Carbon steel sections receive a durable epoxy powder-coat finish that inhibits corrosion, resists electrochemical reactions and provides better coverage than the field-applied finishes common on welded steel tanks. Each section is bolted together in the filed using the appropriate gasket material for the tank contents, such as EPDM rubber or Buna-N gaskets, along with fasteners made from carbon, galvanized or stainless steel. For extra protection from contamination, leaks or corrosion, the fasteners can be capped or fully encapsulated with poly-based materials, or installed using neoprene washers. These features result in a tank that is extremely durable, with a long life cycle and minimal maintenance. Relatively easy. If a section begins leaking, hardware deteriorates, a gasket fails or an accessory malfunctions, the affected section can be disassembled and replaced, without cutting, welding or labor-intensive concrete work. Minimizes labor and maintenance costs and leads to a storage solution with a far longer life cycle. And the installation process happens on-site, requiring large amounts of skilled labor and plenty of time. Also, because of the nature of the process, the installations of concrete and welded tanks are often subject to delays during inclement weather, increasing downtime and potential costs. With bolted steel tanks, much of the manufacturing is done off-site. Once the components arrive at the installation site, the assembly process is quick and efficient, requiring a minimal amount of time and fewer labor costs. The process can be completed in nearly any type of weather, reducing delays, and it allows the tank to be used almost immediately after completion, minimizing downtime. With proper preparation, bolted steel tanks can installed in a matter of days. Over their complete life cycles, concrete and field-welded steel tanks can be expensive to install, maintain and repair. Bolted steel tanks can offer significant cost savings for many applications because they are quick to install, require minimal maintenance and are easy to repair. They often have a longer life cycle than competing designs, and they require fewer labor expenditures for maintenance and repairs. They area a cost-effective storage solution and offer a quick return on investment. With concrete or welded steel tanks, if your capacity needs increase, often the only cost-effective option is to add additional tanks. Expanding or replacing the current tanks may not be feasible or may require too much labor. With bolted steel tanks, new tanks can be added with minimal time and effort, thanks to the quick installation process. In many cases, it is also possible to expand the existing tanks, simply by adding additional sections. This minimizes the extra costs involved for labor and materials and reduces the amount of space required and the downtime associated with the project.